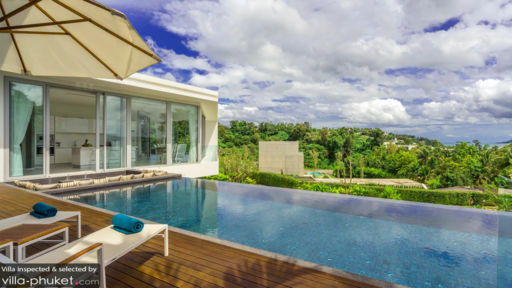 Villa Abiente is a two-level vacation residence that epitomizes innovative architecture and contemporary tropical chic. Glassy interiors – with a consistent white color scheme – are appointed with predominantly carefully chosen, in-vogue and stylish furnishings, fixtures and pieces. Amenities are discriminately five star – for all-out guest delight and enjoyment. 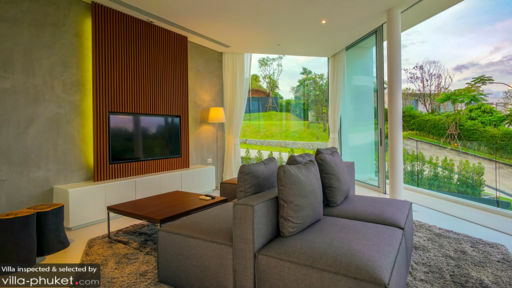 Built on a scenic hillside overlooking the bay, Villa Abiente, truly, affords you a well-deserved, highland break with a classy and swanky ambience. The villa has three air-conditioned bedrooms – all are in the villa’s bedroom wing. All bedrooms have queen-sized beds, as well as dedicated bathrooms with rain showers. Although two of these bathrooms also have double bathtubs. Two of these bedrooms have direct access to the swimming pool. One other bedroom opens out to a private garden. Parallel to the property’s second-level rim is the 12-meter infinity pool. Give in to its beckoning, glassy waters and buoyantly wade to the pool’s scenic edge where you can’t help but linger – spellbound – as you look out to sea. For some sun, you can lie on pool beds partially covered by a large umbrella on the poolside wooden deck. Or relax on the wrap around sofa of the sunken sitting area at one end of the swimming pool. But once it gets quite hot, seek the shade of the covered terrace and sit back on cushioned, wooden chairs as you enjoy a cool, fruity drink. At one end of the villa’s sunny and breezy common wing is the living area. Around its back-to-back sofa, you can all converge to enjoy one another’s company. At the center of the common wing is the dining area with its timber wood table for 10. Here, you can all have your fill of authentic Thai specialties – as well as foreign fare – freshly cooked by the onsite chef at the fully-equipped, modern kitchen at the other end of the common wing. The kitchen has a counter which, provided with stylish stools, serves as a bar for meals, snacks, beverages and all kinds of drinks. The common wing also has a media room where you can all anticipate the new episode of the latest blockbuster series. Or, relive the drama of your all-time, favorite classic movie. The villa belongs to the Baan Yamu Estate. As a guest, you have exclusive access to the estate’s restaurant and bar, to the gym and to the Olympic-sized swimming pool. In charge of carrying out the daily services of the villa is an efficient, friendly staff led by a manager supported by a housekeeper, a chef and a security corps. Upon your request, a spa therapist may be engaged. However, his or her services will be charged separately. A chauffeur-driven car is also available for rent. Villa Abiente is located in Cape Yamu. 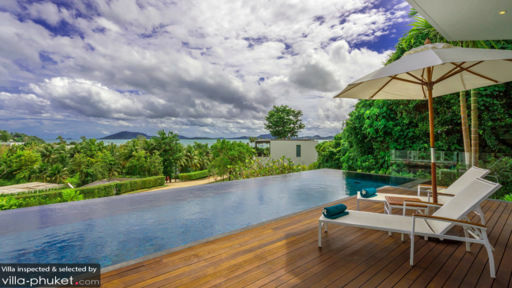 From the villa, go on a boat ride or a cruise around Phang Nga Bay from nearby Yamu Pier, or from a local marina. On a separate excursion, head inland to the Bang Pae Waterfall and to the Gibbon Rehabilitation Center within the Khao Phra Theaeo National Park. Shop at Central Festival – the largest mall in Phuket, as well as spend a Sunday morning indulging in a long and lazy brunch at Breeze.